Wow! Labor Day Weekend is upon us already! It was 17 years ago, this weekend that we made the move from Virginia to Oklahoma. It is good to occasionally stop, look back and remember what all God did to enable us and my entire family (my parents, youngest sister, middle sister and her family) to make the monumental move in one 4 month period. My children were 6, 4, and 3 months old and now they are 23 (and married), 21, and 17; time sure does fly. Of course, it doesn’t seem like it at the time, when you have no time to yourself and have 3 kids calling Mom, Mom, Mom, Moooooommmmm, all the time but sitting on this side, I can definitely attest that it really does go by fast. Brian and Lauren are going on vacation and Sean will house and dog sit for them while they are gone. This is a double whammy for me because I won’t get to see Brian and Lauren while they are gone and my sweet Sean will not be home each night, brightening our home with his sweetness and thus making me FEEL how old my kids are, how much time has flown by, and that he too will be married before I know it, which will be a happy and sad time for me. Happy that he will have found his love but sad that our home will no longer be blessed with his presence on a daily basis. Holiday Grand Plan starts next week. 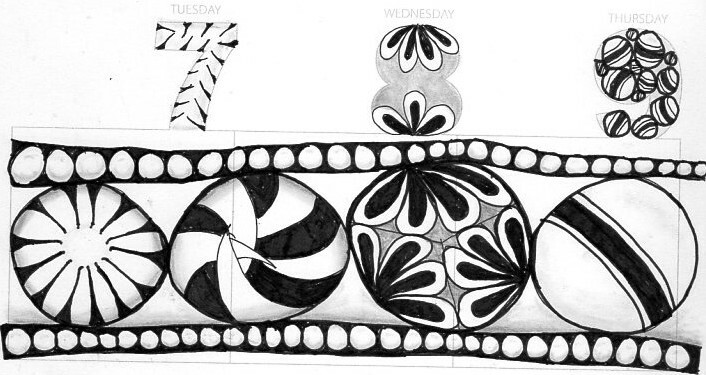 I’m looking over the website and seeing what I will be doing next week. I know it sounds early to be thinking about Christmas, especially with it being so hot here this week but my sister, my mom, and I like to have all of our shopping DONE by Thanksgiving so that we can thoroughly enjoy our favorite time of the year! Consequently we start shopping sometime within the next 2 months. One part of the Holiday Grand Plan is cleaning and decluttering the house. Tiffany and I did NOT get our goal accomplished during her month of vacation from school – namely, getting the library and craft/game room clean, although we DID get started in each, we will have to get that remedied very soon! I’m looking forward to gradually getting everything in order so that the holidays are nice, neat, and fun (couldn’t think of an “n” word that meant fun ). I think I have mentioned before that I, generally speaking, get up when Mike gets up and go to bed when he goes to bed. Left to my own devices I would push myself and stay up until I couldn’t keep my eyes open any longer and then stay in bed the next morning until I felt it was ridiculous to roll over and sleep any more. You see, I don’t like to go to bed and I don’t like to get out of bed either. 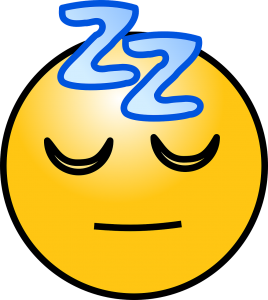 The problem is that each night I would end up going to bed a little bit later and sleeping in a little bit later the next morning than the morning before, until I would probably end up sleeping most of the day and being awake most of the night. So, I have an external control that helps me stay on track and NOT end up getting my days and nights mixed up. Well, I thought this was odd and that I was just weird but this week I read an article that supported me/proved what I have said about myself. It states that without external cues we would run on a 25.4 hour day! They even said, “In extreme cases, an individual can cycle completely around the clock.” Ha! I knew it! I guess I’d be an extreme case without my love! I read this other article about alternative sleep cycles, in which most incorporate some naps throughout the day and sleep fewer hours at one time over night. Naps don’t work very well for me, especially short ones. If it isn’t an hour long nap, I don’t feel like it accomplished anything and if I nap for an hour, I feel very groggy when I awake. These two articles reminded me of one I read several months ago, it might have been this one, about “two sleeps” or “second sleep”. This was the practice, in previous centuries, where people would go to bed when it got dark outside, or shortly thereafter, and sleep for several hours. When they awoke in the middle of the night, they were not bothered by this, as it was a time they would read a book, pray/meditate, or some such other activity for several hours and then go back to bed and sleep for another several hours but not generally sleeping more than 8 hours even though it was spread over a 10-12 hour period. If I ever struggle again, tossing and turning in the middle of the night, I hope I remember this article and go ahead and get up and enjoy some quiet time rather than getting frustrated that I can’t sleep, until I am tired again. In the month of September I will be participating in the 30 Day Pray for Your Spouse Challenge, which can be found on facebook. I also signed up for The Dating Divas’ 7 Days of Love Program for free by signing up for their newsletter, which I thought I’d already signed up for, but oh well! 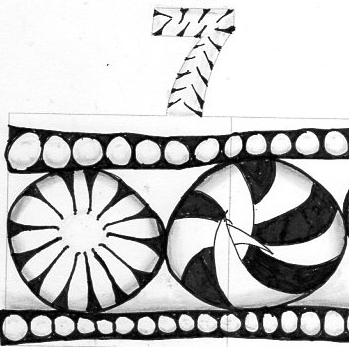 They have a cute little printable 7 day journal you can print out to go along with it. If you print sign up and print out this journal, don’t cut it like they say to. Instead, fold the pages so that the printing is on the outside. Then insert the loose ends of the pages (fold side out) into the fold of the cover page, and then staple. This makes the pages sturdier and no blanks backs. I read some books aloud to my children when they were little but I do not recall doing it a lot. I wish I had. I didn’t realize how valuable it was to their development and pleasure. Now, don’t get me wrong, I did read to my children but I just didn’t do it on purpose as a daily activity; I read to them sporadically. I did not realize that children had a listening comprehension. Okay, yes I knew they could understand words that they could not read but didn’t really get it. I thought the big thing was to get them to read and understand the words they read. I knew my children loved to hear a good book read to them and would frequently ask to have me read it again, right after I’d read it to them but did not really get that there could be any benefit in doing that other than enjoyment. Then I heard about Five In A Row by Steve and Jane Lambert, which is a homeschool curriculum where you read the same easy picture book to your child every day for five days and talk about a different aspect of the book with your child thus giving them “hooks” to remember information they learn. It was during these years that I began to hear about reading aloud to children. When you read a book aloud to your child you are experiencing new places together. 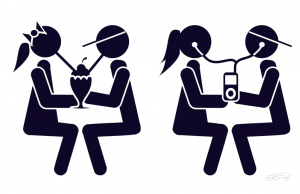 It gives you a conversation starter to talk about situations and behaviors, consequences and rights. It develops a greater vocabulary in your child. AND if you read the right books, it can help develop good morals. I was amazed at the number of “classic” children’s literature that I had NOT read or had read to me and how wholesome and good they were. For example, I had never read Heidi. I had been exposed to the Shirley Temple movie of it but had never had it read to me. That is a shame! I thought it was just another in a long line of books/movies about a poor little orphan kid and I had a hard time dealing with that kind of situation. 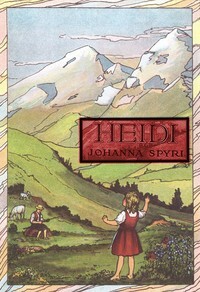 But Heidi, by Johanna Spyri, is such a wonderful book, full of God and always making the best of the situation you are in. I am sad to say that I was 40 years old before I found this wonderful book and I had no idea that secular books actually talked about God at one point in history. I did not read this book aloud until my boys were 13 and 11 and Tiffany was 7; unfortunately she did not remember it, so I read it aloud to hear again when she was about 12 and it became one of her favorite books. So much so that when she got a bunny the next year she named it Schneehopli after one of the goats in the book. One time we got an old copy of Heidi from a book seller. My daughter eagerly began reading it and about three chapters in, came out to me complaining that this book is not Heidi. The version of the book I read to them used the German names for the goats, as you may have guessed from the name of Tiffany’s bunny. Unfortunately this copy translated the names. They probably thought it made the names more meaningful, and it does but it was no longer the beloved goats Tiffany fell in love with, so she deems this book as “The Book that Was NOT Heidi.” This changed the feel of the book for Tiffany and she thinks that they may have changed other aspects of the book as well, but we have yet to prove that accusation. The last book I will mention today is about another girl that is an orphan, Pollyanna by Eleanor H. Porter. One take away from this book is “The Glad Game” where you find something to be glad about, even in disappointment, which is something I wanted my children to emulate after reading this book. It is another book with great perspective. If you haven’t read any of these books yourself or to your children, take the time to do so. I believe they are all available on Project Gutenburg and are definitely worth reading. 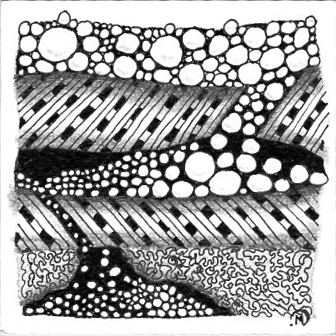 Today I am participating in the Weekly Challenge by The Diva, Laura Harms. I’ve only participated in one other challenge before. I hope to complete more challenges in the future, since I had such a good time doing this one. 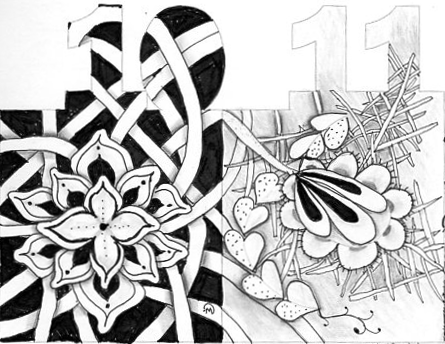 Today I will share my very favorite Zentangles that I have done to date. This time I will start with the last one. I wish I could tell you all the tangles I used but I don’t remember. 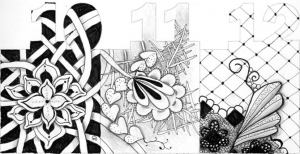 I do know that the main two are Bellaposa (from the Tangle Library iPhone app) and Florz, which is an official tangle by the creators of Zentangle. 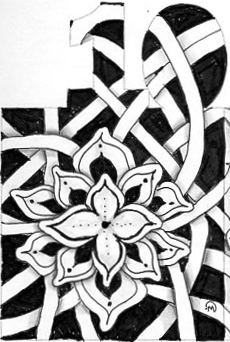 I do remember that the floral design in the lower left corner did not go as I desired it (as in, there was some kind of mistake BUT there are no mistakes with Zentangle) so I kept working on it until it was acceptable to me. In this one I used a variation of Heartvine, Verdigogh, a few remnants of Hollibaugh, and all I can think is that I used part of Kuke. 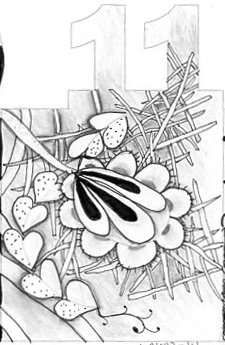 I have always thought that Kuke kind of resembled a flower, so I think I must have taken a segment of it and made it resemble a flower, even more. It’s been a while since I drew these so I can only guess what I did now. This last one is usually everyone’s favorite and if I’m honest, I think it is my favorite as well. I simply used Hollibaugh and Cyme (well, not EXACTLY cyme because I messed part of it up). I really like the overlapping of hollibaugh here and the shading on it as well but I think It is the black background that makes it so vibrant. I really love how the last two flow together! See? I hope these inspire you to try your hand at some Zentangle. I fixed these last week when Brian and Lauren came for dinner. Since there were 6 of us, I doubled this recipe. And since Mike cannot have beef and Lauren doesn’t like turkey, I made one pound with ground beef and one pound with ground turkey. Both were delicious! 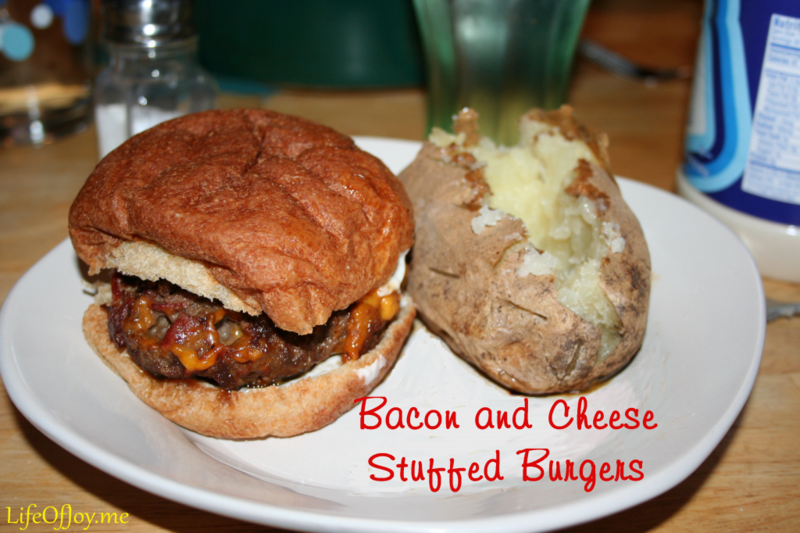 I divided each pound of meat into 3 burgers, making 3 third pound burgers but with the cheese and bacon in them, they were even larger. I do believe that one pound of meat could be stretched to feed 6 if some were smaller children, but we have 6 adults. 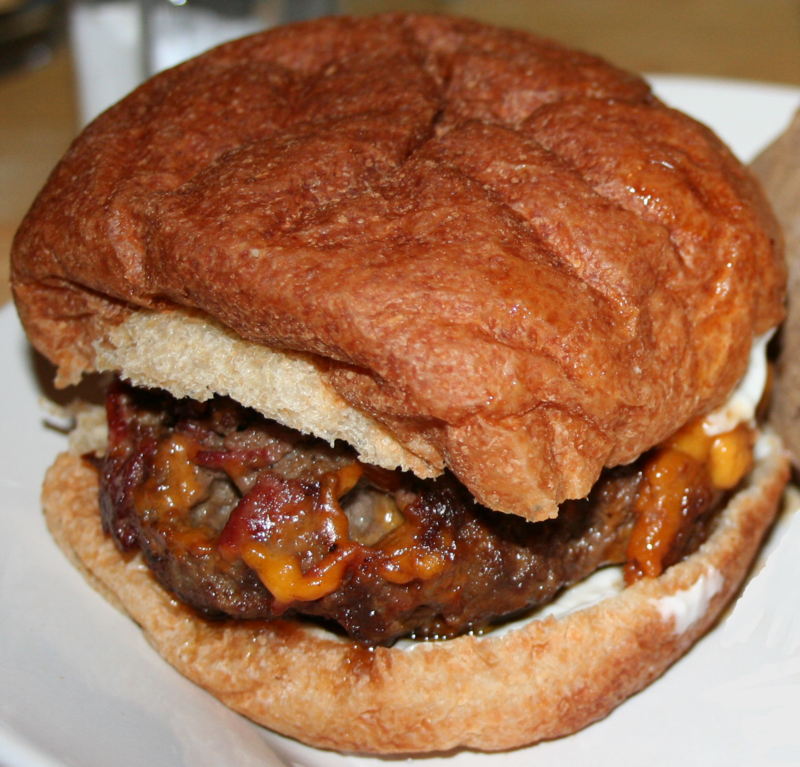 I will also note that those of us that ate the beef burgers were too full for dessert even an hour or more later. I break up the meat in a mixing bowl and add 3-4 shakes of Worcestershire Sauce. (I know this is kind of unappetizing as far as pictures go, but I wanted you to see about how much Worcestershire sauce there is.) Add salt and pepper as desired; I use about 3-4 shakes of my table salt shaker and about 2-3 twists of my pepper mill. 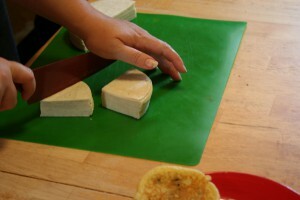 Then cut the cheddar cheese into small cubes. 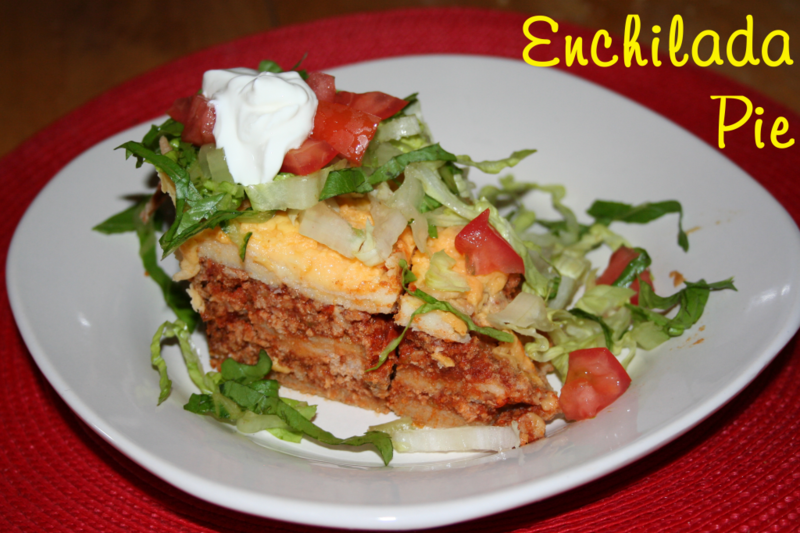 These need to be big enough that they will melt into cheesy pockets of yumminess but small enough that you can get the ground meat worked around them. I used about 3½ ounces of cheddar cheese and cut them into about ¼-inch cubes. 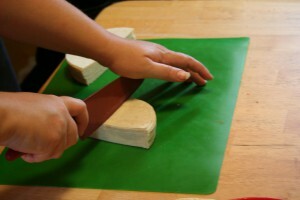 Next cut TURKEY BACON into about ¼-inch square pieces. I do this by stacking about 3 slices of turkey bacon on top of each other. I then cut them in half along the length of the pieces and then cut into approximately ¼-inch pieces all the way down the stack. Now mix it all together ensuring that you are getting as much of that cheese covered with the meat as possible, so that the yummy goodness is melting inside your burger rather than in your pan. Put them in a pan and cook. When I want to hurry them along, I put a lid on the pan, because it will help it to begin cooking on the top as the bottom cooks. Flip when the bottom is browned. 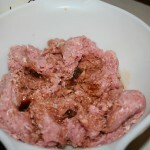 Break thawed meat into a medium size mixing bowl. Add 3-4 shakes of Worcestershire Sauce, salt, and pepper. Add cheese cubes and turkey pieces. Combine as best you can. Fry in non-stick skillet or pan sprayed with oil spray like Pam. Brown on both sides. Hmmm, what is on my mind today? Tiffany has her vacation from “schooling” right now because she “schooled” May through July. Doctor Who’s new season begins airing soon, so we’ve been re-watching the previous seasons, not that it is necessary; it’s just fun. Because we’ve seen them before we put it on in the background while we do other things. I read this article this week. I’ve actually had it open in my browser for most of the week because it was longer than I had time to complete at once and I wanted to be sure to read it all. It is by a pediatrician who has made some interesting observations of children and their parents/guardians. Although I don’t believe that our children need our undivided attention all the time, I think they do need to know they are important and that we value them. If every time my child wants my attention, I make him or her wait – and lose track of time, with how long I are really making him or her wait – I’m sending the message to that child that what I am doing is more important than he or she is. Stop and think about that a minute. Is that email, facebook post, website, online conversation, book, or whatever else I might be doing really more important than my child and my relationship with my child? I am sad to admit that I was guilty of this when my children were young. I needed adult interaction during the day and homeschool forums were vital in helping me learn to do what I needed to do BUT I know that I sent my kids the wrong message. I had to work to fix this. I’ll also admit that there are times, even now, when my daughter wants to tell me about a show or book that she has watched or read and I’m busy and will put her off. It doesn’t happen as often any more than it did, partly because they are older but partly because I choose to focus on them when they talk. I also make sure that I take time to engage with my children, asking what is on their minds, what they are thinking, or what God’s been telling them lately and then I listen. I also read this article on Crosswalk dot com, which I also agree with. While the children need to know they are important, they also need to know that Daddy and God are both more important and that each one has their time. Another big thing is to teach your children to respect you when you are on the telephone. I always found it very frustrating when I’d be talking on the telephone with someone and their child would come up to them and just start talking away and the parent would give the child their attention. When I was on the phone and one of my children came up and started talking to me I would point at them and hold up my index finger, telling them to wait a minute. Then, depending on how important the call was, I would ask my caller to hold for a moment and see what my child needed or I would close my eyes and motion for him/her to go away. Then as soon as I got off the phone, I would find the child and ask what they needed. One other thing I did before I made a phone call was to check with the kids to see if they needed anything and inform them that I was going to make a phone call. This gave them an opportunity to ask me whatever they might want before I placed my call. I love my family. We’ve been having some good, normal/general times this summer. For the first year in ages, I actually have a bit of a tan. I attribute it to the few hours swimming in my son’s pool several times this summer and working outside for thirty minutes to an hour many days prior May through July. Like I said, August has been an odd month, with Tiffany on “vacation” we are completely off schedule, which means we are not getting a whole lot accomplished. Hopefully we will get back on track next week. A couple months ago Brian learned a card game and taught it to the rest of us. We enjoyed playing it a couple of times. Recently I mentioned that we should play it again one night after dinner. It took us a bit to remember how to play the game. It wasn’t as easy as googling it to get the directions and rules because apparently, the name had a curse word in it and he didn’t tell us. We muddled our way through a round and then he found a version online and we had fun paying another round or two. It really is an easy game, if you can get past the name . . . S***head . . . I think we’ll call it by one of its other names, maybe Palace. Anyway, I even think the younger kids could play it, as long as they know sequential order well. Of course it throws a few wrinkles with the 2 and 10, so they have to be firm enough that you don’t confuse them. You can always make them a cheat sheet. I had thought I might write about my favorite read alouds today but I just watched a video by Dollie Freeman that I wish I had had available when my children were young. This is so good that it will be part of Tiffany’s “curriculum” on home educating children this year. This is the link: How to Teach Copywork and Dictation the Charlotte Mason Way. In it Dollie shares about copywork and dictation and how she learned with her first child and changed things with her third. My children, especially Tiffany, were natural narrators only I didn’t know about narration then. She loved to tell me about whatever book she had just read. 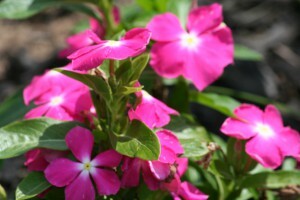 I am sorry to admit that because I did not understand how valuable this was, there were times that I cut her short. So you see, I understand what it is like to have kids around all the time and just need them to stop talking but I encourage you to dig deep within yourself and remain “present” with them, engaging with them. I am glad to report that after I learned that narration was a valuable tool in education, I eagerly listened to her “narrations” any time she wanted. I learned another interesting piece of information by listening to Dollie’s video: we spent way too much time on our copywork and dictation . . . no wonder my kids hated it; although to be honest, they hated anything that took very long to do or involved much writing. She shared that Charlotte Mason suggested only 5-10 minutes on either, if I remember correctly. She also said that the child should do their best work. Now, I’ll admit that I did require my children to do their best work but I think I may have had my standards a bit high. I remember pushing them to write a bit more when they were just learning their letters and pushing them to practice just a bit longer rather than being happy that they had made one or two very good letters and practiced for 5 minutes. Another thing she talked about was the child having a book of quotes in their own handwriting that brings them pleasure. I wish I had let them pick more of the things they wrote, so that it would have been more of a keepsake that they enjoyed. Although, I do remember giving them more freedom when they were older, I wish I had let them pick things when they were younger. And I guess it is important to really let them pick, even if it means the things they copy are hints for a video game. Dollie also mentions the Charlotte Mason method of spelling. 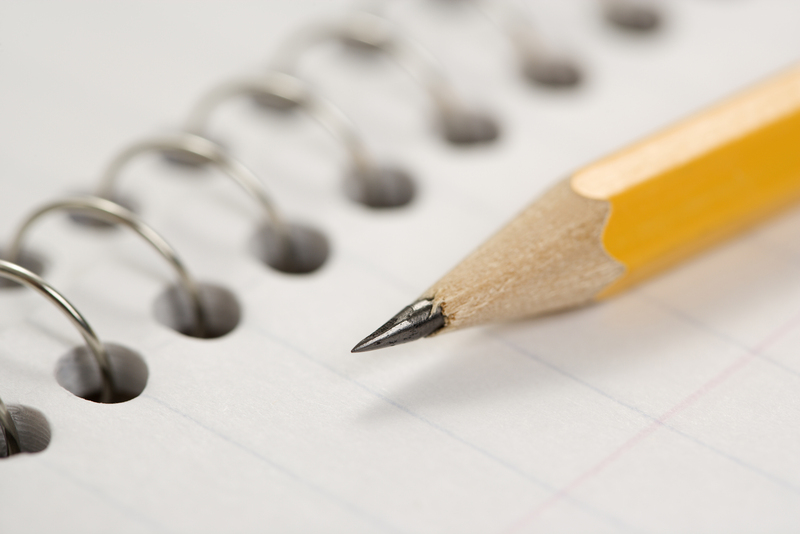 I treated dictation as more of a pre-test to gather spelling words than being concerned with them getting it right at the time of dictation. Oh, I bet my kids wish I’d have known this method when they were young. Charlotte Mason’s method is to allow the child to look over the material to be dictated ahead of time AND EVEN point out words or punctuation that you think the student might get stumped on, so that they can take a visual picture of it and get it correct. Wow! That viewpoint is so much more encouraging than looking for mistakes in their work so that they have more work to do. Well, since I cannot do it over again, I hope I can share my failures with you and you can avoid them (especially if the “you” reading this happens to be my children ). I really encourage you to take the time to watch Dollie’s video. (It’s free.) I do not get any compensation for sending you there, I just think it is worth listening to – and enlightening. 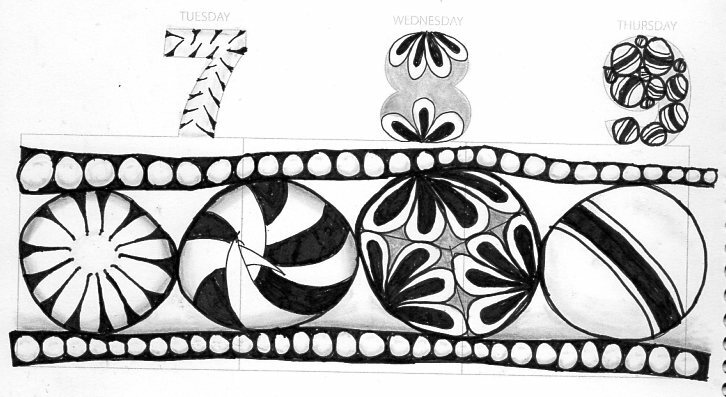 I love Carole Ohl’s Tangle-A-Day Calendar. Here is one page I did earlier this year. 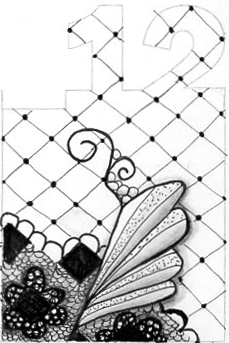 This one has ornamato, pepper, cirquital, kuke, and jetties. 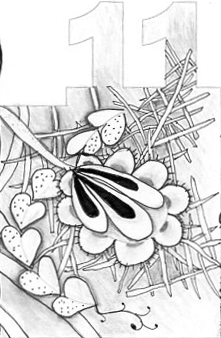 I really enjoy drawing Kuke, as I think it looks really nice and nearly floral. 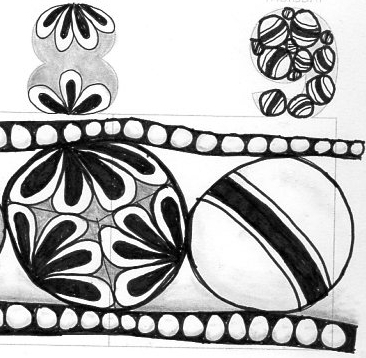 I hope this inspires you to try your hand at some Zentangles yourself! I’m really going to have to get better at taking pictures before we eat. I’m managing to get pictures taken while I make it but when it is finished, we are a bit impatient to eat. I took this one with the leftovers. I was first introduced to this yummy casserole when I was a teen and our family was on vacation in Nags Head, I think, with another family from church. Brenda, the matriarch of the other family, made this for all of us for dinner one night and it left an impression on me. Years later the church put together a cookbook for a fund raiser, I purchased one and thankfully this recipe was in that book. My children have never liked onions cooked in food but actually like the flavor of onion powder in foods; I guess it is the “crunch” of the vegetables that they don’t like. Consequently I use onion powder instead of an onion in this recipe. There is a similar problem with tomatoes, so I either puree the canned tomatoes or use crushed tomatoes; it all depends on what I have on hand. I love cheese. Thus I always think the more cheese the better BUT that is not very frugal. This recipe has a unique way of tricking the taste buds to think that there is more cheese in it . . . trust me, you have no idea, when eating it, that you aren’t eating cheesy goodness. Oh! 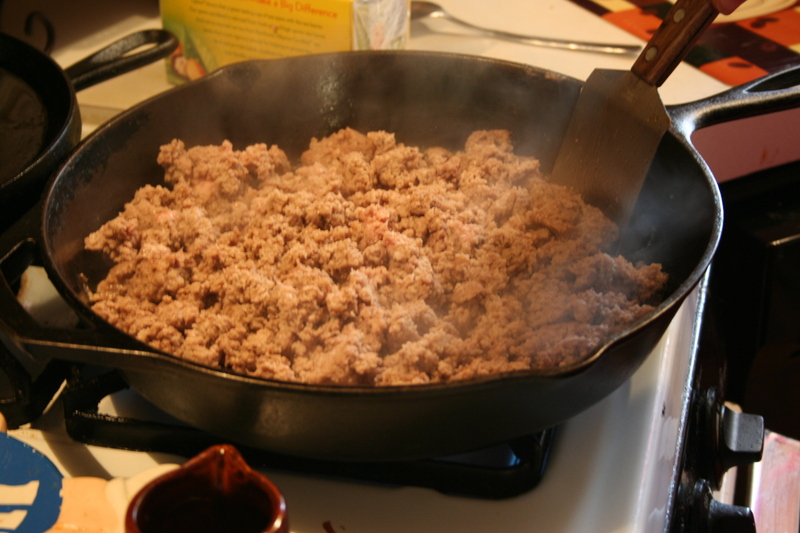 One final thing before I share the process of making this yummy dish, although it uses two pounds of ground meat it makes A LOT. Just last Saturday I fed our family of six – 5 adults and one 17yo – AND had LEFTOVERS. Thus this recipe really could be cut in half or serve what you need (half or less for family of 4) and wrap and freeze the other half, once it cools. I have actually done this during the holidays for an easy meal. This recipe has passed the Pickiness Test by Lauren. It is a new addition to her favorite foods list. Next I add the onion powder. I don’t really know how much, maybe a ½ tablespoon or so – basically, I just shake it on, sprinkling it over the entire surface of the meat, until I smell it. Then add the garlic powder, salt, and pepper, and mix it all together. If I use a can of diced tomatoes, I puree it in my mini food processor or with my hand blender, while the meat is browning. 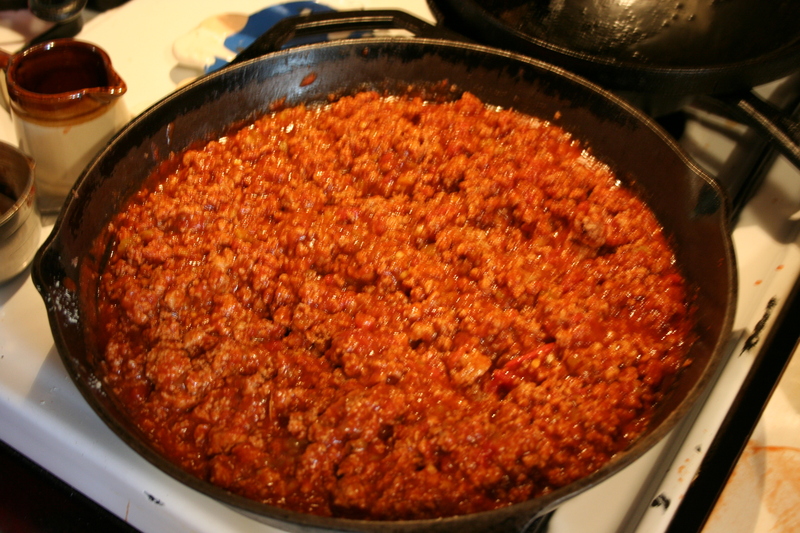 Next I add the tomato puree (or crushed tomatoes), can of tomato sauce, package of taco seasoning, and chili powder. I puree the green chiles the same way I did the tomatoes and add them to the meat mixture as well. The sauce is now complete. 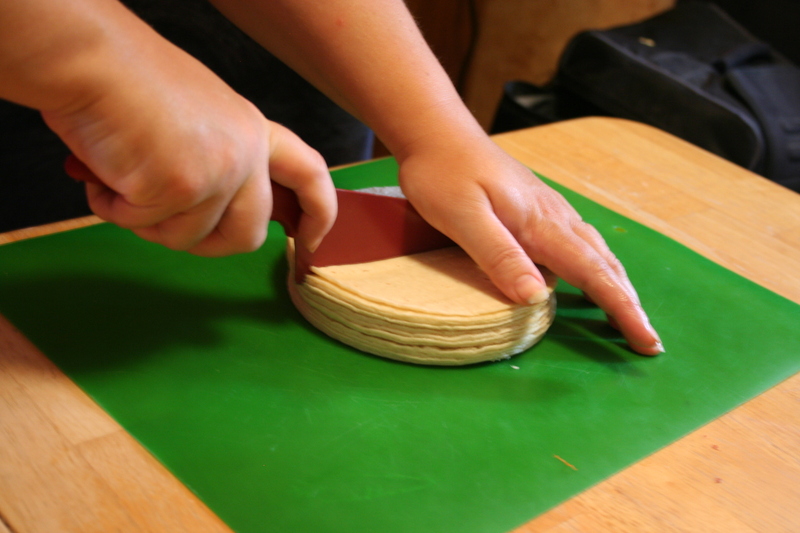 Next cut the corn tortillas into pieces to cover the casserole dish evenly. 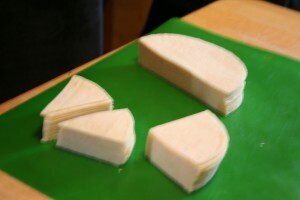 Here is how I cut them. Take the stack and cut it in half. Then take one half and cut it in half. I sometimes cut them in half yet again. Now layer them in the casserole dish sprayed with “Pam”. I use a 9×13 baking pan. Next pour the sauce over the tortilla pieces and layer the other half of the tortilla pieces on top. Combine the cream of chicken soup and milk and pour over the tortillas. 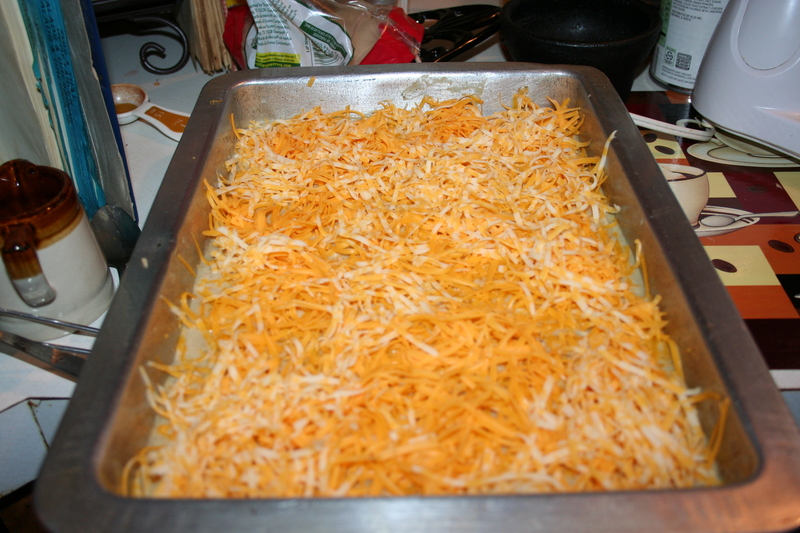 Then top with the shredded cheese. Bake at 350º for about 45 minutes (or until cheese is bubbly). 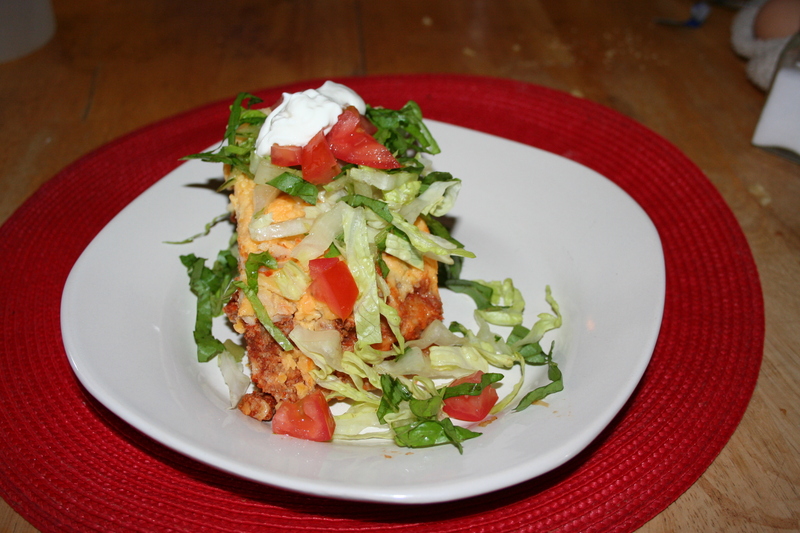 Serve with lettuce, tomato, sour cream, and/or hot sauce. When I made this Saturday, I made it in the crock pot so that we wouldn’t heat up the house. I put about 1/3 of the tortillas on the bottom, 1/2 the sauce, 1/3 tortillas, about 1/3 of the cream soup milk mixture, a bit of the cheese, the rest of the sauce, last of the tortilla pieces, remaining soup milk mixture, and the rest of the cheese. 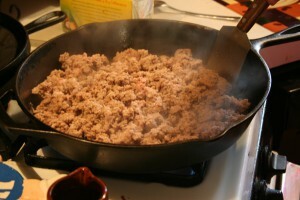 Brown ground meat and diced onion (drain if necessary) in a large skillet and crumble meat. Add garlic powder (and onion powder if not using fresh onion). Add salt, pepper, chili powder, taco seasoning, tomato sauce, green chiles, and crushed tomatoes. 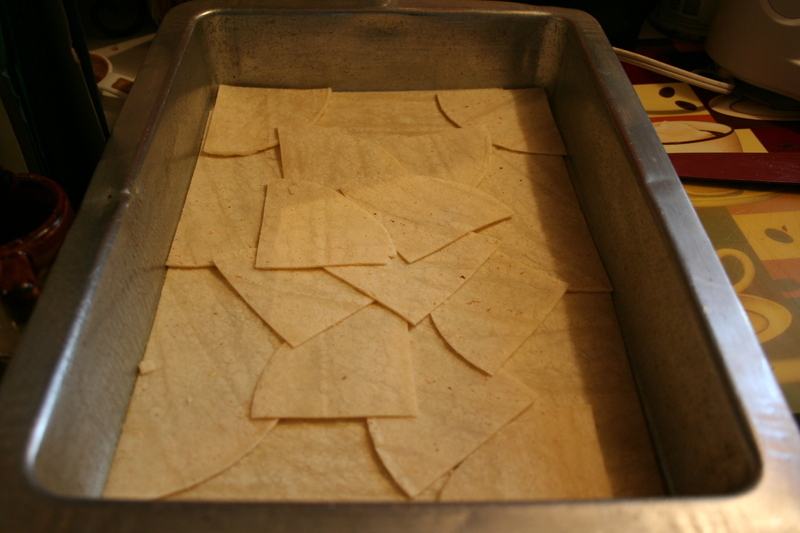 Cut tortillas and place half in the bottom of a slightly greased 9x13 pan, covering completely. Layer on the other half of the tortilla pieces, covering all the meat. Combine the cream of chicken soup and milk. Pour over tortilla pieces. Sprinkle the shredded cheese over soup milk mixture. Bake uncovered at 350º for about 45 minutes or until the cheese is bubbly. 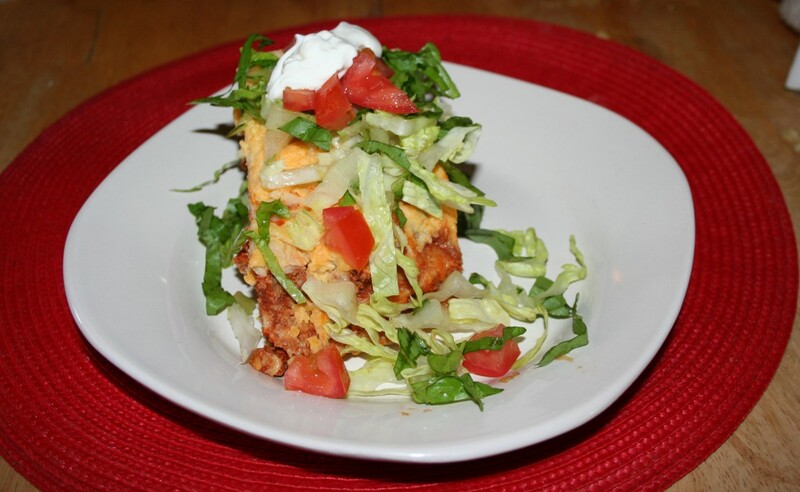 Serve with thinly sliced lettuce, diced tomatoes, sour cream, and/or hot sauce.